Mike Nelson, recovering clutterer and author of 10 books on various subjects, including Stop Clutter from Stealing Your Life, has done it again. 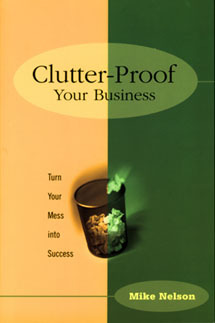 In his second book on cluttering, Clutter-Proof Your Business, Nelson helps the inveterate business clutterer, get a grip on the problem. Cluttering can and does stifle productivity. And in the workplace, productivity equals money. In this book he tells his readers how to eliminate clutter from their offices, and by doing so, become more efficient and profitable. There are many books on the market about getting organized, but Nelson’s voice-of-experience style hits home. He, himself, lost a lucrative job because of cluttering. So he relates his first-hand knowledge of cluttering in a clear, conversational tone. He cuts through to the root of the problem with insight and objectivity that can only be gotten from painful experience. In doing so, he offers practical, realistic tips to permanently help those who haven’t been able to combat their disorganization problem. Staying organized and reducing clutter increases profits. Disorganization is more then mere piles of papers. It represents a psychological or emotional blockage in life. Nelson offers long-term solutions to piles of files and overflowing To-Do lists. He shows his readers what’s really important. According to Nelson, the first step in understanding a cluttering problem is to know what kind of clutterer a person is. After that, he helps his readers to know what works and what doesn’t. According to statistics provided by the National Association of Professional Organizations, paper clutter is the No. 1 problem for most offices. Redundancy is the cause, as most offices keep copies of copies of copies. And, of course, everyone sent a letter or message must send a copy to their boss and their boss’s boss, creating a giant monster that ultimately eats up the business, itself. Nelson recommends dating files and not practicing the "Don’t file and forget it" rule. He also offers advice on how to organize computer files and set up workable directories. He also shows his readers how to use today’s technology to improve their productivity and not fall into the trap of accumulating technical equipment for the sake of keeping up with technology. One of Nelson’s most valuable chapters is on organizing the home office. With so many people working at home today, the information in this chapter is invaluable to many. Nelson shows home business owners how to separate their business space and clutter from their personal clutter. He also helps them think through how they use time so that they become more productive. Mike Nelson’s new book deserves a serious look by anyone overwhelmed by the clutter of business.